Scientists are using ancient methods to create delicious new vegetable crossbreeds—and chefs are taking notice. Now Matt Louis, the chef at Moxy, an inventive restaurant in Portsmouth, New Hampshire, stepped toward my table. Slowly, grinning diabolically, he brandished a little decanter containing bubbling habanero broth. Louis trickled the liquid into a bowl containing the fixings for a soup: romanesco, brussels sprouts, calamari. The waitstaff hovered nearby, watching. Even though I’d put Louis up to this stunt—even though I had provided him with a jar of the habaneros, samples of a new variety that had been bred for flavor instead of five-alarm fire—I couldn’t help feeling a little nervous. I took a spoonful of soup, then another. The taste of the habaneros was tropical and fruity, with hints of pineapple and orange. Without the intense heat, I could savor the sweetness. Was this a GMO trick? Was I destined to glow in the dark? Not at all. These mild habaneros were the work of an old-school plant breeder at Oregon State University, Jim Myers. Using methods that date back to the days of the pharaohs, he had strategically crossed habanero plants in his test garden, selecting for the mildest chiles. Working with several hundred plants over nine years, he bred out the heat. Unlike most modern plant breeders, Myers doesn’t try to improve yield, uniformity, storability and ease of shipping. Along with a small but growing number of horticulturists, his aim is flavor. He keeps both pro and amateur cooks and growers in mind when creating new crossbreeds that he hopes will offer both uncommon taste and versatility in the kitchen; for his mild habaneros, he even consulted with chefs. And he is finding an audience. His mild habanero seeds won’t be available to the public until 2016, but his Indigo Rose tomatoes, sweet and purple as plums, are already offered by companies like Johnny’s Selected Seeds. Meanwhile, his peers at places like Cornell University’s Vegetable Breeding Institute are introducing their own innovations to the world, like the honeynut squash—smaller than a butternut (each is a single serving), and more flavorful. Chefs are also beginning to connect with plant breeders on a grassroots level, at least in Portland, Oregon, thanks to the efforts of an entomologist named Lane Selman. Selman’s job title is quite wonky: She is a research coordinator in the horticulture department at Oregon State University. She’s also a hip, hyperactive innovator with a cult following. In 2012, while she was in her thirties, she launched the Culinary Breeding Network, with the stated goal of “bridging the gap between breeders and eaters.” Her first gesture was a party at which Portland’s top chefs tasted Myers’s habaneros. Later, she began inviting chefs to her test plots outside Portland, to taste obscure and experimental kales and beets. And last fall, she gathered 12 chefs and paired each one with a plant breeder who supplied a new vegetable variety that the chef in turn worked into a recipe. When I ate at Moxy last fall, it was Selman who had UPS’d the habaneros to New Hampshire, along with what seemed like thousands of pages of arcane information. Somehow she made clear that these peppers were more than just produce. And I realized I needed to fly west to talk with their promoter. Scattered around us, on shelves, in corners, were dozens of lovely, strange squash. Some were long and columnar, with bulging bells at the base; others were round and green with rough skin, like the hide of an alligator. But looks weren’t the main point; taste was. Just four days earlier, Selman had hosted a “squash party” here, introducing chefs to this array of gourds, some of them bred to be delicious when eaten raw. We ate. We took pictures of peppers. Then Mace told me he’d just ventured out to Selman’s test plots, to pick habaneros in the rain. Le Pigeon’s pastry chef, Nora Antene, had already experimented with a different kind of mild habanero in a sherbet. But Mace was just now wrapping his mind around the possibilities. Oregon State’s Lane Selman reveals the most promising and disappointing innovations from the Culinary Breeding Network. These colorful beets have rings in brilliant yellows, oranges and reds and are mild and sweet enough to eat raw. The rounded top simplifies chopping and deseeding; the smooth, unwrinkled skin roasts evenly and peels easily. Thin-skinned yet naturally resistant to insects, this deep orange squash resembling a mini butternut is a single-serving size. Grown for the leaves, not the stalks; breeders tried with mixed results to tone down the bitterness. “Chefs’ reactions ranged from hopeful to hopeless,” Selman says. Though sweet and tender, the broad, flat leaves look more like collard greens than kale. Many cooks found that off-putting. 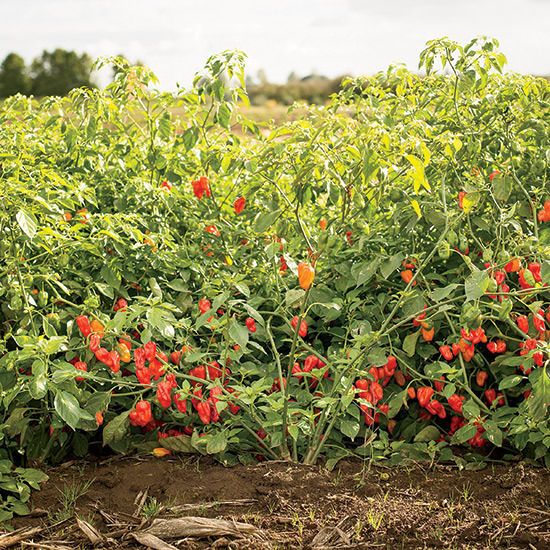 Experiments in growing tropical peppers have been challenging in Portland’s cool climate. Bill Donahue has written for the Atlantic, the New York Times Magazine and Wired. He lives in Portland, Oregon.